← An educational psychology career – get the lowdown from someone who knows! We recently hosted an Eco careers week, with a focus on sustainable careers, and I know some PPLS students missed out on some of the events. 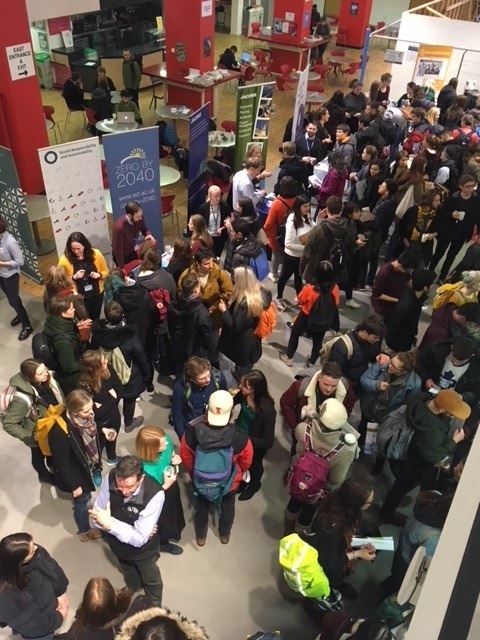 If that’s you, or you’re curious about the wide range of opportunities in this area, and how to get into it, you’re luck’s in, as our great information team have pulled together a summary of the main event, Careers in Sustainability, so you don’t have to miss out. Read Top tips from the panel of experts, watch the video from the event, and explore the relevant links to find out more about this fascinating, wide-ranging and vital career area. The event was chaired by Professor Dave Reay, Chair in Carbon Management and Education, University of Edinburgh. He is also designer and editor of the climate change science website Greenhouse Gas Online and the Southern Ocean: Antarctic Seas and Wildlife website. Stuart Brown, Zero Carbon Options Development Manager, University of Edinburgh. A Rolls-Royce trained Engineer with more than 25 years in business and entrepreneurship. Stuart now leads the team within the Department of Social Responsibility and Sustainability focusing exclusively on renewable energy and low carbon projects. Kate Chambers, Recycling Advisor at Vegware Ltd, a plant-based food packaging company based in Edinburgh. Kate is also Chair of Communications with the 2050 Climate Group. With an MLitt in Environmental Communication, Kate is interested in finding new ways to talk about and tackle climate-based issues. Rebecca Petford, Scotland Programme Manager, Environmental Association of Universities and Colleges (EAUC) which supports all universities and colleges in Scotland to embed sustainability. Rebecca is a University of Edinburgh alumnus with an MSc in Environment, Culture and Society. Sandy MacDonald, Head of Corporate Sustainability at Standard Life Aberdeen Plc. After studying Biological Sciences at the University of Edinburgh, Sandy worked briefly in book publishing in London. He joined Standard Life, initially working in a technical role, and completed a Chartered Institute of Marketing diploma. He now has over 15 years’ experience in senior marketing, communications, government relations and corporate social responsibility roles. Make something happen…you can find a list of relevant societies on the Students’ Association website. Remember, everyone you meet could be a useful resource at some stage in your career. Check out our guest blog post from the Students’ Association Volunteering Service on the top six reasons for getting involved in Volunteering, and how you can find out more. When you build your network, you can hear about more job opportunities. Follow our advice to make the most of networking and how to use LinkedIn effectively. You don’t need to be a scientist to be involved in sustainability! Be open to different opportunities to gain transferable skills and apply the theory aspect. Learning doesn’t stop after you graduate! In need of some inspiration? Read this blog article from Andy Baker, a University of Edinburgh Alumnus, who studied Ecology and Environmental Science on his journey to becoming an Assistant Forest Manager at Tilhill Forestry – one of the exhibitors at our event. Try not to take job rejections personally as there could be various reasons as to why you may have been unsuccessful. Be resilient and continue to submit applications as securing a role can take time. This entry was posted in Career planning, General interest and tagged eco careers, environmental careers, sustainability. Bookmark the permalink.